it is merely the absence of light. Open yourself to the Light! Celebrate endings - for they precede new beginnings. The darkest night is often the bridge to the brightest tomorrow. A flower is a weed seen through joyful eyes. Trust your own inner guidance. carrying you toward your dreams. and believe that your feet will carry you well. that all of life is not black and white. Honor diversity in all seasons. to harness the winds of JOY. If it's Right, stand up for it - together. and cavort your most uninhibited play. breathe in, breathe out - nothing more. 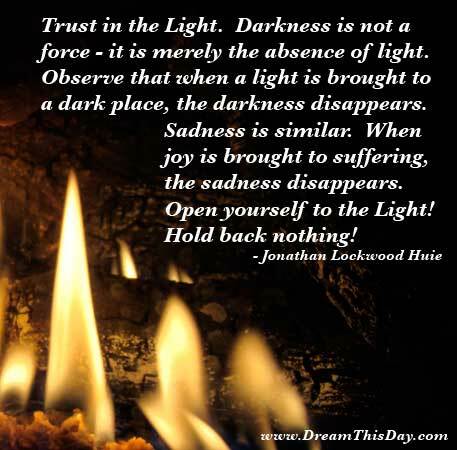 Thank you for visiting: Trust in the Light. by Jonathan Lockwood Huie.